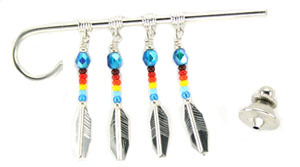 Navajo crafted, sterling silver, honor flag with four dangling feathers that come with assorted crystal bead and assorted seed beads. Measures about 2 1/2"L and feathers dangle down to 1 3/4"L. Artisan is Juanity Manygoats. Can be used as a tie tac or a hat pin. Colors and placements of beads will vary. Currently available in black, red, green or light blue as main larger bead color. Choose color or let us choose for you.